Charm Kao is named after the humble bowl of rice. It's what's mixed with that rice that makes Charm Kao so special. 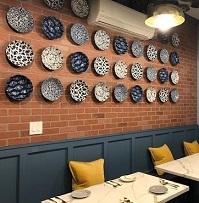 The restaurant, in Downtown Brooklyn, is designed to reflect a night out in Bangkok with foods from various regions of Thailand. The North brings Sai Oar, a Northern style herb sausage. From the South comes Kua Kling, ground pork with curry paste, fresh chili and kaffir lime leaves. Steamed Whole Fish in a spicy lemony sauce represents the Central region. Northern cuisine brings Papaya Salad with tomato, and peanuts in a spicy Thai lime dressing, and Laab made with ground toasted rice, red onion, coriander and mint. It's offered with a choice of chicken or mushroom. Salads, noodle dishes and rice bowls are also available at Charm Kao along with a selection of curry dishes.